Big Moves Proposed in U.S. Shark Management – Ya Like Dags? It’s been quite the week for sharks and the fisheries that target them. First, ICCAT managed to disappoint on shark management (largely through the actions of Canada of all places) but finally started following scientific advice on bluefin tuna quotas. Then, in better news, the European Union Parliament voted to close loopholes in their shark fishery management laws, requiring all sharks to be landed with their fins attached. This not only effectively bans the practice of finning sharks at sea, but also makes them easier to identify at the dock so at-risk species can be more effectively monitored. Meanwhile on our side of the Atlantic, the National Marine Fisheries Service has released a list of proposed new rules for Atlantic and Gulf coastal shark fisheries. There is some very interesting stuff in there that may cause some big changes in shark fishery management. The proposed changes to the commercial fishery aren’t too radical, and represent measures that scientists have been in favor of for a while. Basically, NFMS is looking to break up the old “fishery complex” scheme in which most shark species are grouped as either large or small coastal sharks and quotas are assigned for the species as a group. This creates problems because not all sharks in the group have the same growth and birth rates, so not all species in the complex can handle the same level of fishing. To fix this, NMFS has been conducting species-specific stock assessments on shark species and is proposing breaking some species out of the fishery complexes to be managed on their own. These include the large hammerheads, blacknose sharks, and blacktip sharks form the Gulf of Mexico (an assessment of the Atlantic stock is still in progress). These species would be given their own separate quotas, and the severely declining large hammerheads would be given a very low one in the hopes of curbing overfishing. With scalloped hammerheads proposed for listing on the Endangered Species Act, this should take some of the pressure off of the species from the general coastal shark fishery, and will also allow the agency to monitor the situation for hammerheads specifically. The next big proposal for the commercial fishery is the establishment of a series of time-area closures to reduce longline effort in areas important to sensitive species, especially the dusky shark. Essentially, fishing won’t be allowed in these areas at times when these patches of ocean are important as nursery habitat or migratory corridors for duskies. Some closures already exist, and the new rules would reduce the size of some existing areas while adding new ones in the northern end of the dusky range, reflecting new information on dusky shark habits. Current and proposed longline time-area closures for the shark fishery. Image from NMFS. One of the biggest, most obvious proposed changes (and one that’s already gotten some press) is a dramatic increase in the recreational size limit for coastal sharks. Again, this is largely to protect dusky sharks, which have the unfortunate combination of occurring in many of the same areas where other sharks are fished and a much slower growth rate. Currently, the recreational size limit is 4 1/2 feet, which is within the size at maturity for many coastal sharks such as blacktips and sharpnoses, but way under the size at maturity for dusky sharks. NMFS is proposing increasing the recreational size limit to an impressive 8 feet. This makes some sense for the recreational shark fishery, which is largely a trophy fishery, but may create some issues for charter operators specializing in sharks. The issue is that the coastal shark rec fishery is dependent on the blacktip shark, which is one of the species doing alright under the latest stock assessments. Blacktips also very rarely get larger than 6 feet in length, meaning that under the proposed size limit blacktips couldn’t be kept at all (I have it on good authority that blacktip is actually pretty good, so sharks landed in the recreational fishery aren’t usually wasted). In order to survive under the proposed rules, the recreational shark fishery would likely have to become a strictly catch-and-release fishery. From an ecological standpoint, this is ideal, but it still represents a shift in business practices for charter operators. 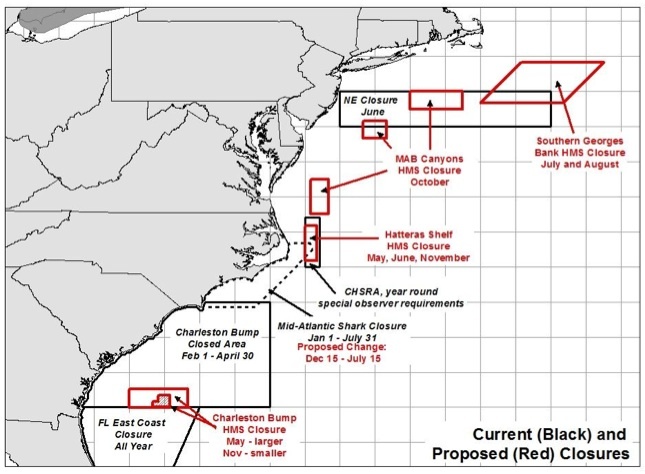 That said, purely catch-and-release fisheries can still be an economic driver (adult red drum in North Carolina are a good example) and some shark tournaments have already made this shift. So why not have species-specific recreational limits for sharks? While this may be possible at some point, dusky sharks are just about the most nondescript-looking shark in the ocean. These sharks can be very difficult to tell apart from other, less ecologically-sensitive species, especially for recreational fishermen who may not be as familiar with species ID. In fact, misidentification is probably the biggest threat to dusky sharks (landing the species has been prohibited since 1999, so it’s unlikely that anyone is actually targeting them). By increasing the size limit to 8 feet, even misidentified immature duskies should be protected. This “161 lb blacktip shark” is actually a dusky. Image from hooked-in.com. These are currently only proposed rules and are the NMFS-preferred options, though generally I find these to be positive steps. The full list with all the biological information leading to them is available here, and public comments can be submitted to NMFS until February 2013 (instructions for submission at the bottom of the document). The possible closed area off of Georges Bank in July would, I’m guessing, not be loved by the sword/ bigeye boats. Nice piece Chuck.